The folks at Hodderscape have just released the new cover art and blurb for the forthcoming Children of Earth and Sky by Guy Gavriel Kay. The cover was designed by Ben Summers. For more info about this title: Canada, USA, Europe. In extraordinary times, no lives are untouched, legends emerge. Danica Gradek, from a walled town of pirates – who joins a sea-raid filled with a long desire for vengeance. The merchant Marin Djivo who will keep his head when others lose theirs. Leonora Valeri forced to be a spy, destined for something very different. Pero Villani travelling east to paint the world’s most powerful man, and perhaps do more…They will all be tempered and tested in war-torn lands that lie between the silver city on its lagoon to the west and the thrice-walled golden city in the east. Their lives will intersect, history will change. 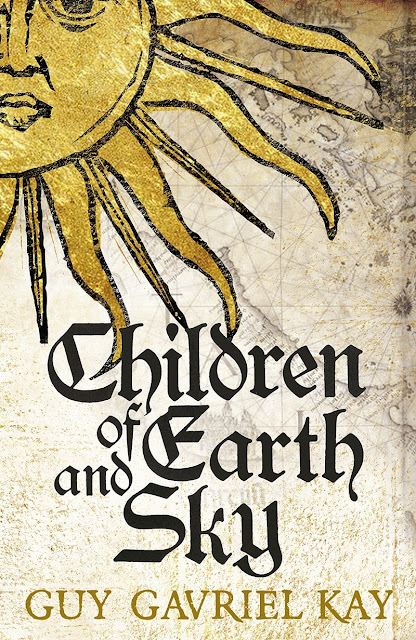 Children of Earth and Sky is the spell-binding epic new historical fantasy from prize-winning author Guy Gavriel Kay. Blending history and the fantastic, it is a towering achievement that will delight fans and new readers alike. Can't wait to sink my teeth into this one!!! I wonder if this book takes place in the world of "Lions of Al-Rassan" and the Sarantine Mosaic? It sounds like it does. It also sounds like Sarantium may have fallen to the Asharites. Very interesting!